Aamir Khusrau teaching his disciples in a miniature from a manuscript of Majlis al-Ushshaq by Husayn Bayqarah. Ab'ul Hasan Yamīn ud-Dīn Khusrau (1253 – 1325) (Persian: ابوالحسن یمین الدین خسرو‎, Urdu: ابوالحسن یمین‌الدین خسرو‎), better known as Amīr Khusrow Dehlavī, was a Sufi musician, poet and scholar from India. He was an iconic figure in the cultural history of South Asia. He was a mystic and a spiritual disciple of Nizamuddin Auliya of Delhi, India. He wrote poetry primarily in Persian, but also in Hindavi. A vocabulary in verse, the Ḳhāliq Bārī, containing Arabic, Persian, and Hindavi terms is often attributed to him. Khusrow is sometimes referred to as the "voice of India" (Tuti-e-Hind), and has been called the "father of Urdu literature." Khusrow is regarded as the "father of qawwali" (a devotional music form of the Sufis in the Indian subcontinent), and introduced the ghazal style of song into India, both of which still exist widely in India and Pakistan. Khusrow was an expert in many styles of Persian poetry which were developed in medieval Persia, from Khāqānī's qasidas to Nizami's khamsa. He used 11 metrical schemes with 35 distinct divisions. He wrote in many verse forms including ghazal, masnavi, qata, rubai, do-baiti and tarkib-band. His contribution to the development of the ghazal was significant. Amīr Khusrow was born in 1253 at Patiyali near Etah in modern-day Uttar Pradesh, India, in what was then the Delhi Sultanate, the son of Amīr Saif ud-Dīn Mahmūd, a man of Turkic extraction. Amīr Khusrow's father, Amīr Saif ud-Dīn Mahmūd, was born a member of the Lachin tribe of Transoxania, themselves belonging to the Kara-Khitai set of Turkic tribes. He belonged to Kesh, a small town near Samarkhand in what is now Uzbekistan, and that is where he grew up. When he was a young man, that country was despoiled and ravaged by Genghis Khan's invasion of Central Asia, and much of the population fled to other lands, India being a favored destination. A group of families, including that of Amir Saif ud-Din, left Kesh and travelled to Balkh (now in northern Afghanistan), which was a relatively safe place; from here, they sent representations to the Sultan of distant Delhi seeking refuge and succour. This was granted, and the group then travelled to Delhi. Sultan Shams ud-Din Altamash, ruler of Delhi, was himself a Turk like them; indeed, he had grown up in the same region of central Asia, and had undergone somewhat similar circumstances in earlier life. This was the reason the group had turned to him in the first place. Altamash not only welcomed the refugees to his court but also granted high offices and landed estates to some of them. In 1230, Amir Saif ud-Din was granted a fief in the district of Patiyali. Ameer khushak married Bibi Daulatnaz, the daughter of Rawat Arz, Hindu noble and war minister of Ghiyas ud-Din Balban, the ninth Sultan of Delhi. Daulatnaz's family belonged to the Rajput community of modern-day Uttar Pradesh. Amir Saif ud-Din and Bibi Daulatnaz became the parents of four children: three sons (one of whom was Khusrow) and a daughter. Amir Saif ud-Din Mahmud died in 1260, when Khusrow was only seven years old. After the death of her husband, Khusrow's mother moved back to her father's house in Delhi with her children. It was thus in the house of his Rajput maternal grandfather, Rawat Arz (known by his title as Imad-ul-Mulk), that Khusrow was raised. He thus grew up very close to the culture and traditions of Indian society. Over and over again in his poetry, and throughout his life, he affirmed that he was an Indian Turk (Turk-e Hind). Khusrow was an intelligent child. He started learning and writing poetry at the age of eight. His first divan, Tuhfat us-Sighr (The Gift of Childhood), containing poems composed between the ages of 16 and 18, was compiled in 1271. In 1273, when Khusrow was 20 years old, his grandfather, who was reportedly 113 years old, died. After Khusrow's grandfather's death, Khusrow joined the army of Malik Chajju, a nephew of the reigning Sultan, Ghiyas ud din Balban. This brought his poetry to the attention of the Assembly of the Royal Court where he was honored. On 9 March 1285, Khan Muhammad was killed in battle while fighting Mongols who were invading the Sultanate. Khusrow wrote two elegies in grief of his death. In 1287, Khusrow travelled to Awadh with another of his patrons, Amir Ali Hatim. At the age of eighty, Balban called his second son Bughra Khan back from Bengal, but Bughra Khan refused. After Balban's death in 1287, his grandson Muiz ud-Din Qaiqabad, Bughra Khan's son, was made the Sultan of Delhi at the age of 17. Khusrow remained in Qaiqabad's service for two years, from 1287 to 1288. In 1288 Khusrow finished his first masnavi, Qiran us-Sa'dain (Meeting of the Two Auspicious Stars), which was about Bughra Khan meeting his son Muiz ud-Din Qaiqabad after a long enmity. After Qaiqabad suffered a stroke in 1290, nobles appointed his three-year-old son Shams ud-Din Kayumars as Sultan. A Turko-Afghan named Jalal ud-Din Firuz Khalji then marched on Delhi, killed Qaiqabad and became Sultan, thus ending the Mamluk dynasty of the Delhi Sultanate and starting the Khalji dynasty. In 1290 Khusrow completed his second masnavi, Miftah ul-Futuh (Key to the Victories), in praise of Jalal ud-Din Firuz's victories. In 1294 Khusrow completed his third divan, Ghurrat ul-Kamaal (The Prime of Perfection), which consisted of poems composed between the ages of 34 and 41. After Jalal ud-Din Firuz, Ala ud-Din Khalji ascended to the throne of Delhi in 1296. Khusrow wrote the Khaza'in ul-Futuh (The Treasures of Victory) recording Ala ud-Din's construction works, wars and administrative services. He then composed a khamsa (quintet) with five masnavis, known as Khamsa-e-Khusrow (Khamsa of Khusrow), completing it in 1298. The khamsa emulated that of the earlier poet of Persian epics, Nizami Ganjavi. The first masnavi in the khamsa was Matla ul-Anwar (Rising Place of Lights) consisting of 3310 verses (completed in 15 days) with ethical and Sufi themes. The second masnavi, Khusrow-Shirin, consisted of 4000 verses. The third masnavi, Laila-Majnun, was a romance. The fourth voluminous masnavi was Aina-e-Sikandari, which narrated the heroic deeds of Alexander the Great in 4500 verses. The fifth masnavi was Hasht-Bihisht, which was based on legends about Bahram V, the fifteenth king of the Sasanian Empire. All these works made Khusrow a leading luminary in the world of poetry. Ala ud-Din Khalji was highly pleased with his work and rewarded him handsomely. When Ala ud-Din's son and future successor Qutb ud-Din Mubarak Shah Khalji was born, Khusrow prepared the horoscope of Mubarak Shah Khalji in which certain predictions were made. This horoscope is included in the masnavi Saqiana. In 1310 Khusrow became close to a Sufi saint of the Chishti Order, Nizamuddin Auliya. In 1315, Khusrow completed the romantic masnavi Duval Rani - Khizr Khan (Duval Rani and Khizr Khan), about the marriage of the Vaghela princess Duval Rani to Khizr Khan, one of Ala ud-Din Khalji's sons. After Ala ud-Din Khalji's death in 1316, his son Qutb ud-Din Mubarak Shah Khalji became the Sultan of Delhi. Khusrow wrote a masnavi on Mubarak Shah Khalji called Nuh Sipihr (Nine Skies), which described the events of Mubarak Shah Khalji's reign. He classified his poetry in nine chapters, each part of which is considered a "sky". In the third chapter he wrote a vivid account of India and its environment, seasons, flora and fauna, cultures, scholars, etc. He wrote another book during Mubarak Shah Khalji's reign by name of Ijaz-e-Khusravi (The Miracles of Khusrow), which consisted of five volumes. In 1317 Khusrow compiled Baqia-Naqia (Remnants of Purity). In 1319 he wrote Afzal ul-Fawaid (Greatest of Blessings), a work of prose that contained the teachings of Nizamuddin Auliya. In 1320 Mubarak Shah Khalji was killed by Khusro Khan, who thus ended the Khalji dynasty and briefly became Sultan of Delhi. Within the same year, Khusro Khan was captured and beheaded by Ghiyath al-Din Tughlaq, who became Sultan and thus began the Tughlaq dynasty. In 1321 Khusrow began to write a historic masnavi named Tughlaq Nama (Book of the Tughlaqs) about the reign of Ghiyath al-Din Tughlaq and that of other Tughlaq rulers. Khusrow died in October 1325, six months after the death of Nizamuddin Auliya. Khusrow's tomb is next to that of his spiritual master in the Nizamuddin Dargah in Delhi. Nihayat ul-Kamaal (The Zenith of Perfection) was compiled probably a few weeks before his death. Khusrow is credited with fusing the Persian, Arabic, Turkish, and Indian musical traditions in the late 13th century to create qawwali, a form of Sufi devotional music. Qaul (Arabic: قَوْل) is an "utterance (of the prophet)", Qawwāl is someone who often repeats (sings) a Qaul, and Qawwāli is what a Qawwāl sings. The word sama is often still used in Central Asia and Turkey to refer to forms very similar to qawwali. Amir Khusrow was a prolific classical poet associated with the royal courts of more than seven rulers of the Delhi Sultanate. He wrote many playful riddles, songs and legends which have become a part of popular culture in South Asia. His riddles are one of the most popular forms of Hindavi poetry today. It is a genre that involves double entendre or wordplay. Innumerable riddles by the poet have been passed through oral tradition over the last seven centuries. Through his literary output, Khusrow represents one of the first recorded Indian personages with a true multicultural or pluralistic identity. Musicians credit Khusrau with the creation of six styles of music: qaul, qalbana, naqsh, gul, tarana and khyal, but there is insufficient evidence for this. Khusrow wrote primarily in Persian. Many Hindustani (historically known as Hindavi) verses are attributed to him, since there is no evidence for their composition by Khusrow before the 18th century. The language of the Hindustani verses appears to be relatively modern. He also wrote a war ballad in Punjabi. In addition, he spoke Arabic and Sanskrit. His poetry is still sung today at Sufi shrines throughout India and Pakistan. Hamin ast o hamin ast o hamin ast. In English: "If there is a paradise on earth, it is this, it is this, it is this." This verse is also found on several Mughal structures, supposedly in reference to Kashmir. Tuhfat us-Sighr (The Gift of Childhood), 1271 - Khusrow's first divan, contains poems composed between the ages of 16 and 18. Wast ul-Hayat (The Middle of Life), 1279 - Khusrow's second divan. 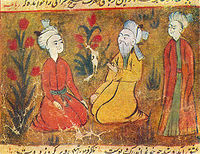 Qiran us-Sa’dain (Meeting of the Two Auspicious Stars), 1289 - Khusrow's first masnavi, which detailed the historic meeting of Bughra Khan and his son Muiz ud-Din Qaiqabad after a long enmity. Miftah ul-Futuh (Key to the Victories), 1290 - Khusrow's second masnavi, in praise of the victories of Jalal ud-Din Firuz Khalji. Ghurrat ul-Kamaal (The Prime of Perfection), 1294 - poems composed by Khusrow between the ages of 34 and 41. Khaza'in ul-Futuh (The Treasures of Victories), 1296 - details of Ala ud-Din Khalji's construction works, wars, and administrative services. Khamsa-e-Khusrow (Khamsa of Khusrow), 1298 - a quintet (khamsa) of five masnavis: Matla ul-Anwar, Khusrow-Shirin, Laila-Majnun, Aina-e-Sikandari and Hasht-Bihisht. Saqiana - masnavi containing the horoscope of Qutb ud-Din Mubarak Shah Khalji. Duval Rani - Khizr Khan (Duval Rani and Khizr Khan), 1316 - a tragedy about the marriage of princess Duval Rani to Ala ud-Din Khalji's son Khizr Khan. Nuh Sipihr (Nine Skies), 1318 - Khusrow's masnavi on the reign of Qutb ud-Din Mubarak Shah Khalji, which includes vivid perceptions of India and its culture. Ijaz-e-Khusravi (The Miracles of Khusrow) - an assortment of prose consisting of five volumes. Baqia-Naqia (Remnants of Purity), 1317 - compiled by Khusrow at the age of 64. Afzal ul-Fawaid (Greatest of Blessings), 1319 - a work of prose containing the teachings of Nizamuddin Auliya. "A King Offers to Make Amends to a Bereaved Mother" is a painting based on a story written by Amir Khusrau Dihlavi, but illustrated by Mughal Indian artist, Miskin, in 1597-98. Tughlaq Nama (Book of the Tughlaqs), 1320 - a historic masnavi of the reign of the Tughlaq dynasty. Nihayat ul-Kamaal (The Zenith of Perfection), 1325 - compiled by Khusrow probably a few weeks before his death. Qissa Chahar Dervesh (The Tale of the Four Dervishes) - a dastan told by Khusrow to Nizamuddin Auliya, resulting in Auliya becoming cured from his illness. Ḳhāliq Bārī - a versified glossary of Persian, Arabic, and Hindavi words and phrases often attributed to Amir Khusrow. Hafiz Mehmood Khan Shirani argued that it was completed in 1622 in Gwalior by Ẓiyā ud-Dīn Ḳhusrau. Jawahir-e-Khusravi - a divan often dubbed as Khusrow's Hindavi divan. ^ Rashid, Omar (23 July 2012). "Chasing Khusro". Chennai, India: The Hindu. Retrieved 5 August 2012. ^ "Amīr Khosrow - Indian poet". ^ Jaswant Lal Mehta (1980). Advanced Study in the History of Medieval India. 1. Sterling Publishers Pvt. Ltd. p. 10. ISBN 9788120706170. ^ Bakshi, Shiri Ram; Mittra, Sangh (2002). Hazart Nizam-Ud-Din Auliya and Hazrat Khwaja Muinuddin Chisti. Criterion. ^ Bhattacharya, Vivek Ranjan (1982). Famous Indian sages: their immortal messages. Sagar Publications. ^ Latif, Syed Abdulla (1979) . An Outline of the Cultural History of India. Institute of Indo-Middle East Cultural Studies (reprinted by Munshiram Manoharlal Publishers). p. 334. ISBN 81-7069-085-4. ^ Regula Burckhardt Qureshi, Harold S. Powers. Sufi Music of India. Sound, Context and Meaning in Qawwali. Journal of the American Oriental Society, Vol. 109, No. 4 (Oct. – Dec. 1989), pp. 702–705. doi:10.2307/604123. ^ a b Schimmel, A. "Amīr Ḵosrow Dehlavī". Encyclopaedia Iranica. Eisenbrauns Inc. Retrieved 14 May 2016. ^ a b c "Central Asia and Iran". www.angelfire.com. ^ Asad, Muhammad (16 February 2018). "Islamic Culture". Islamic Culture Board – via Google Books. ^ "Alexander is Lowered into the Sea". www.metmuseum.org. Retrieved 14 December 2018. ^ "Hazrat Mehboob-E-Elahi (RA)". www.hazratmehboob-e-elahi.org. ^ a b c Sharma, Sunil (2005). Amir Khusraw : the poet of Sufis and sultans. Oxford: Oneworld. p. 79. ISBN 1851683623. ^ "'Amir Khusrau and the Indo-Muslim Identity in the Art Music Practices of Pakistan'". ^ "'Amir Khusro and his influence on Indian classical music'". ^ Willard, N. Augustus (1834). A Treatise on the Music of Hindoostan. Calcutta. ^ Losensky, Paul E. (15 July 2013). "In the Bazaar of Love: The Selected Poetry of Amir Khusrau". Penguin UK – via Google Books. ^ Tariq, Rahman. "Punjabi Language during British Rule" (PDF). JPS. 14 (1). Archived from the original (PDF) on 15 September 2012. ^ Habib, Mohammad (16 February 2018). "Hazrat Amir Khusrau of Delhi". Islamic Book Service – via Google Books. ^ Dihlavī, Amīr Khusraw (16 February 1975). "Amir Khusrau: Memorial Volume". Publications Division, Ministry of Information and Broadcasting, Government of India – via Google Books. ^ Devy, G. N. (16 February 2018). "Indian Literary Criticism: Theory and Interpretation". Orient Blackswan – via Google Books. ^ Rajan, Anjana (29 April 2011). "Window to Persia". The Hindu. Chennai, India. ^ India, Press Trust of (7 September 2013). "Zubin Mehta's concert mesmerises Kashmir" – via Business Standard. ^ "Zubin Mehta's concert mesmerizes Kashmir - The Times of India". The Times Of India. ^ Blake, Stephen P. (30 April 2002). "Shahjahanabad: The Sovereign City in Mughal India 1639-1739". Cambridge University Press – via Google Books. ^ Shīrānī, Ḥāfiż Mahmūd. "Dībācha-ye duvum [Second Preface]." In Ḥifż ’al-Lisān (a.k.a. Ḳhāliq Bārī), edited by Ḥāfiż Mahmūd Shīrānī. Delhi: Anjumman-e Taraqqi-e Urdū, 1944.